Only 45 miles from Abingdon, Bays Mountain Park and Planetarium in Kingsport, Tennessee is one of the nicest large parks in the region. It is right off of Interstate 26, Exit 3, Meadowview Parkway. The entrance to the park is just a few miles to the south of the exit. With 3,550 acres and an extensive network of 37 miles of trails, it offers a good place to do some trail running or mountain biking in an enclosed, very pretty natural park. The trails are a mix of old fire roads and single track. There are several good annual trail running races within the park, most notably the Bays Mountain 15 Mile Trail Race, which is in September and starts from the nature center area, and the Laurel Run Ascent, which is in April and starts in Laurel Run Park (accessed from Church Hill, Tennessee). I did the Bays Mountain 15 miler several years ago and can attest to it being one of the nicer trail races in the region. Bays Mountain Park has nature programs and dedicated habitat areas—essentially large pens—for bobcat, wolves, river otters, turtles, and raptors. This area of Bays Mountain Park is similar to the Western Carolina Nature Center in Asheville, North Carolina. There are not as many exhibits at Bays Mountain as at WCNC; however, the wolf exhibit at Bays Mountain is larger and better. The photo gallery below shows some areas of the park close to the nature center. Click on a photo to see a description of it. I recently visited Bays Mountain with my son for an elementary school field trip. (This park hosts many school field trips; during our visit there were also school field trips from Scott County, Va. and from Hawkins County, Tenn.). With the school group, we visited the nature center, listened to a lecture on the wolves, and watched a program at the planetarium. During the wolf lecture, the park official explained how wolves live in packs, their feeding habits and pack behavior, and then demonstrated how the wolves howl. She prompted the wolves to howl with her own human “howl,” which involved cupping her hands to her mouth and then initiating a howling sound and was unlike an ordinary human imitation of a wolf howl. The wolves responded slowly at first, and then all of them seemed to howl together. This lasted several minutes. It was quite loud, actually pretty fascinating to hear, and was the highlight of the trip. We then proceeded to the planetarium. The planetarium has a modern Carl Zeiss planetarium projector that allows the audience to sit back and look up onto the domed ceiling to watch an accurate representation of the night sky. This was the first time I had seen a planetarium show since I was a child at the Adler Planetarium in Chicago, so it was a treat. The Bays Mountain Park website indicates they also have quality telescopes and allow the public to use them at designated times in the evenings. Bays Mountain Park has a 44 acre lake named the Kingsport Reservoir that was apparently originally used as the major source of water for the city of Kingsport. The lake has many inlets, lily pads, and bass and bluegill that were visible from the shore. Overall, this park is a nice asset to the region, one often overlooked as a place for outdoor recreation considering how close it is to Abingdon and Southwest Virginia. It’s definitely worth a day trip. 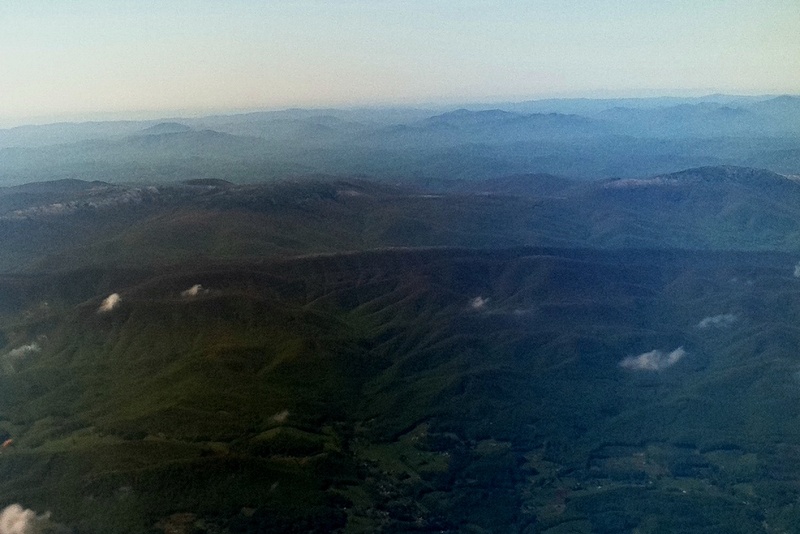 This interesting aerial photograph, taken during the day on May 5, 2011, shows a thin band of snow on the crest of Iron Mountain in the foreground and two wider bands of snow on Mount Rogers on the left and on Whitetop Mountain on the right. On Wednesday, May 4, 2011, the temperature dropped precipitously across Southwest Virginia in the evening. It rained in Abingdon during the night but as the photo shows it snowed with just a tad of accumulation in the higher elevations. This week perhaps the worst set of tornadoes in history hit the South. In Washington County, Virginia, where I live, we experienced tornadoes unlike anything in the last 60 years. This tragic event prompted me to recall some of my own personal experiences with extreme weather, and to contemplate the fierce, uncontrollable power of nature from the perspective of those who love the outdoors. I quickly closed down the office and drove home. As I drove home, there was lightning and thunder all around in the sky. Our family spent the night in our unfinished basement. My wife and I sat in lawn chairs, watching the weather reporters who broke into the regular TV evening programming, while our children lay in sleeping bags on the basement floor. We experienced some anxiety and fear, but I also was curious and strangely fascinated in what was happening. Having grown up in the Midwest, I had experienced tornado watches and had done innumerable tornado “drills” in school, but I did not recall ever previously being in the direct projected path of one. Actually, there was some disconnect between my view outside of our house and the weathermen’s Doppler radar graphics showing the super cells and tracking them in real-time. I periodically opened our basement door, looked outside, and never did I hear the locomotive engine roar that was associated with tornadoes. There was no incredible wind or horrible hail as was being reported on TV. The closest we got to the action were the sounds of hail pounding the television station studio coming through the TV, thunder in the distance, and the shrill call of Abingdon’s fire engines and ambulances through the night. The worst thing that we physically experienced that night was lack of sleep. I had to awake and leave early for work Thursday. Our cable TV went out in the early morning, so I did not know the state of affairs until my wife called me and told me the news that a tornado directly hit the small community of Glade Spring. Later that day, my office manager, who lives near Glade Spring (and who thankfully was alright), explained what she saw on her drive to work. “It would make you cry,” she said. I would later appreciate how bad it was: Glade Spring looked like a war zone, and individuals with whom my family has connections were killed. Numerous students whom my wife teaches at Patrick Henry High School in Emory, Virginia suffered damage to their homes. Virginia Governor Bob McDonnell declared a state of emergency that morning, and as of this writing the roads are still closed in Glade Spring and a curfew is still being imposed there. Glade Spring is just a few miles from my house in Abingdon. The tornado that hit there would have come right through the middle of Abingdon if it had been on a trajectory just a mile or so to the north. We were fortunate that it did not come through our neighborhood, like the tornado did in 1944. The storm spawned a series of tornadoes that traveled northeast at high speeds, some as fast as 100 miles per hour. Their glide path essentially paralleled I-81. This may have been what allowed them to maintain themselves. In our region, tornadoes coming from the Tennessee and Ohio valleys usually peter out by the time they come across the Appalachian Mountains. Not this time. On Thursday afternoon I was sent a photo of Virginia Creeper Trail Trestle No. 7. This is one of the longest and most beautiful trestles on the trail. 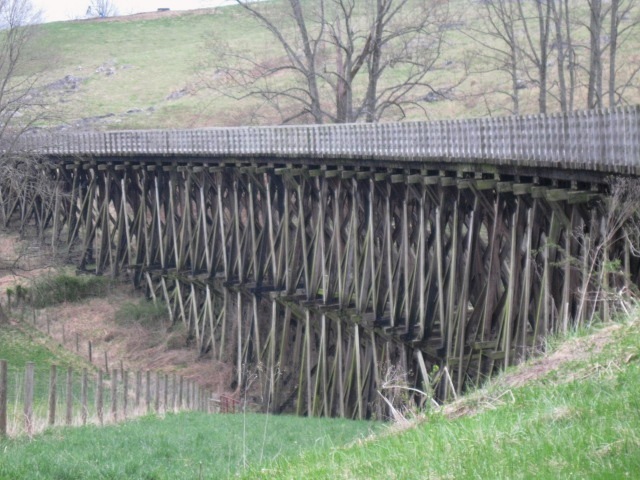 It spans (or spanned) a large dry creek bed on the Smith Farm between Watauga Road and Alvarado, and is the only trestle wholly located in open pastureland, allowing the intricacy of its curved design to be viewed from an approach from either direction on the trail. 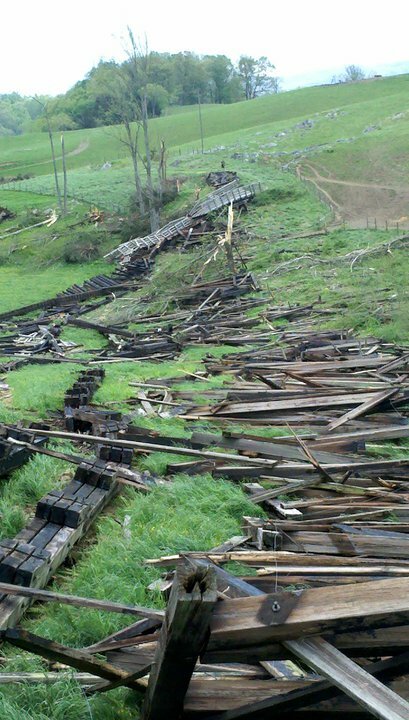 The photo was jaw dropping, not only because it showed the trestle completely demolished, but because my son and I had traveled over it and had stopped to take pictures of it barely a month earlier. I could remember the feeling of the cool March breeze across the trestle, the sound of the trestle while running over it (running on the trestles creates a unique, woody, slightly dampened thud with each footstep), and the smell of its aged railroad ties and wooden planks as if we had just completed our workout a few minutes ago. Now I was looking at a photograph of it utterly obliterated. Photo of Trestle No. 7 taken by Karl Thiessen in late March 2011. This may be the last photo of Trestle No. 7 before it was destroyed. We often forget—or take for granted—the danger of extreme weather and how paltry human frailty is in comparison. It takes an event like the one on Wednesday to humble us and renew our respect for nature’s power. “So Fast, So Sudden” read the newspaper headline in the print edition of the Bristol-Herald Courier print edition on Friday morning. Seeing the photos of the devastation in Glade Spring, I was chastened to realize how cavalier I had been on Wednesday evening about the power of the storm and the seriousness of the situation. Those drawn to the outdoors know that there is some element of danger in every adventure, and we cannot go outside without accepting some risk. Driving on the highway to and from the trailhead remains the most risky element of most adventures most of the time. Yet the longer it is since we have personally experienced nature’s power, the less conscious and less respectful of it we usually become. Similarly, those who come away from first-hand encounters with extreme weather completely unscathed also may develop a hubris that leads to being less cautious when the weather may turn poor. We misinterpret our good fortune and consciously or unconsciously convince ourselves that it was not but for the Grace of God that we were spared, but that we have acquired some kind of mastery over nature. Of course, nothing could be further from the truth. It takes something dramatic to shock us into recognition of that which we should know without a reminder. 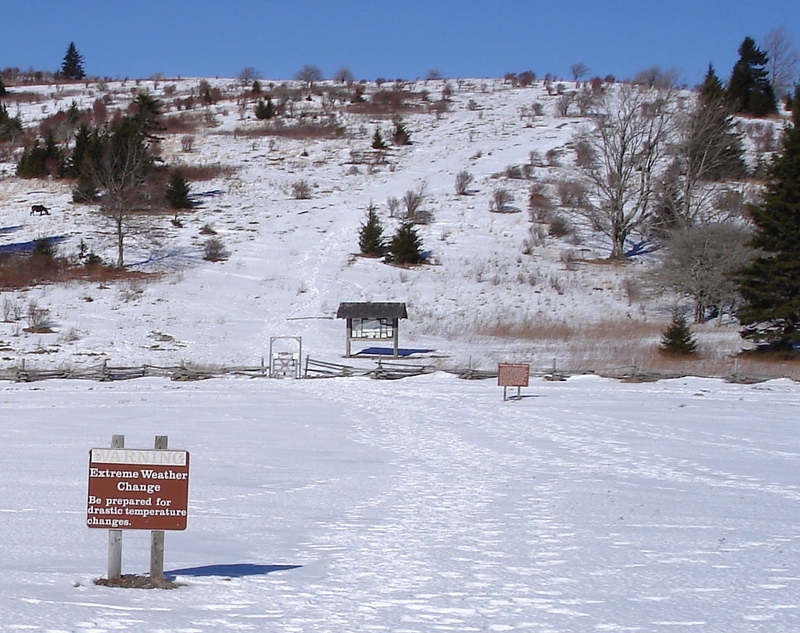 Sign at the Trailhead to Wilburn Ridge and the Appalachian Trail at Grayson Highlands State Park in Virginia announces "WARNING: Extreme Weather Change - Be prepared for drastic temperature changes"
In the mountains, the weather can change in a heartbeat, and those who go unprepared or ignore the reality of our frailty sometimes suffer serious, even deadly, consequences. The harrowing tale of the storm on Mount Everest in 1996 may be the most held out example of this phenomenon. As reported in Into Thin Air, in 1996 a number of climbing teams, whose leaders were trained and experienced with protocols concerning safety and “turnaround” times lost sight of these rules in their aspiration to get their clients and themselves to the summit of Everest. The teams’ leaders ignored the warning signs and their own protocols when the weather turned bad. As a consequence eight climbers perished and a number of others were permanently injured. “Summit fever,” as it is known in mountain climbing, manifests whenever people outdoors lose respect for nature’s power, become consumed with themselves and their own personal objectives, and as a result make poor choices that may end in dire consequences. The storm on Everest in 1996 was not predicted and came upon the climbers suddenly. While the climbers could not have avoided all adversity related to the storm, the previous years’ relative safety may have lulled the climbers into apathy or lack of appropriate concern regarding the ever-present danger of extreme weather. I personally experienced an unpredicted and uncanny swift change of weather while on a mountain climbing expedition last year on Mt. Shasta in California. Mt. 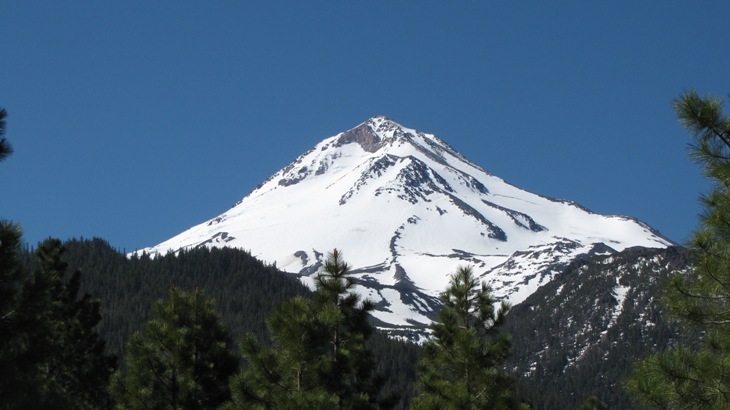 Shasta, 14,000+ feet above sea level, is the southernmost intact volcano in the Cascade Range (Mt. Lassen, 70 miles away, is technically the southernmost volcano, however Mt. Lassen is not fully intact due its eruption in 1915 that blew most of the top cone off of it). The main climbing route up Mt. 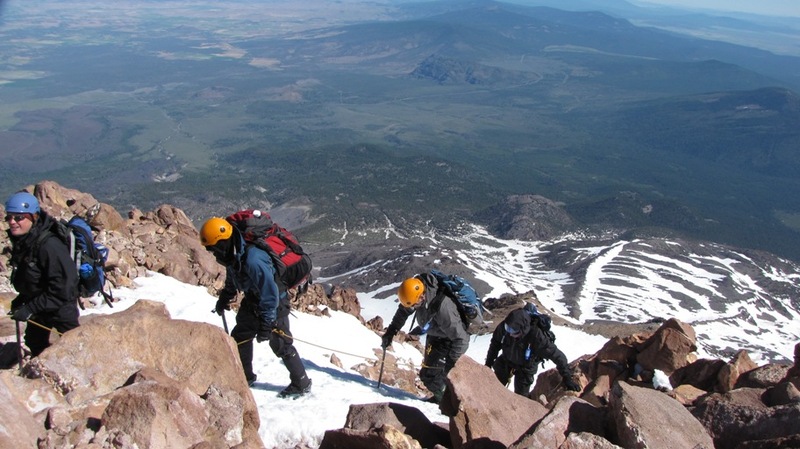 Shasta, known as the Avalanche Gulch route, is easier than the main climbing routes up Mt. Rainer in Washington. We were climbing with several folks who had successfully summited Mt. Rainer the previous year. Therefore, in planning this trip we decided to climb Mt. Shasta via the Hotlum-Bolam Ridge route, a much more difficult, less taken, and semi-technical route with some 45 degree pitches that ascended a ridge between two glaciers on the on the northeast side of the mountain. We had planned and coordinated the Mt. Shasta climb for months—actually for almost a year. We carefully chose to do the climb during the best “weather window” based upon studies of previous years. We chose the last week of June/first week of July, based upon the fact that the snowpack would still be good but the weather and chances of storms would be minimal. The weather forecasted for the climb was perfect. No rain or snow was predicted. The first day of the climb, we had great conditions, a blue sky and warm temperatures. At base camp at 10,000’, we were ready for the final ascent the next day and were awoken by the guides at 2 am. We got ready quickly and started climbing in the dark for the summit push. View of the Hotlum-Bolam Route on Mt. Shasta taken June 28, 2010, the first day of the climb. There was not a cloud in the sky, and perfect climbing conditions were forecasted. We were surprised, however, that it was colder than expected—mainly because of the wind chill. None of us remembered seeing anything on the weather reports before the trip about the wind chill. With the wind chill, the temperatures were below freezing. At one rest stop at about 12,000’, I began to shiver uncontrollably. The guide told me to take some ibuprofen, that the altitude may have caused some swelling in my blood vessels that could be affecting my circulation. As we continued to climb, I would warm up while moving, but the wind chill was making our rest stops, which were a necessity at the altitude, difficult because we were cooling down so fast every time our movement stopped. And with each stop higher on the mountain, the wind’s intensity increased and made it still yet colder. The route required us to climb more or less straight up the northeast side of the mountain until we were almost at the summit. About 200 yards from the summit our route required us to traverse around the north side of the mountain to the western side, where we would walk across a flat section near the top about the size of a football field and then climb just a few feet to the true summit on the southwestern peak. As we began the traverse, the wind velocity continued to increase with each step. The wind was blowing 40+ miles per hour in our faces. Walking forward with crampons became difficult. With two groups of five climbers roped together, our purchase on the rocks and snow during the traverse was becoming increasingly more treacherous due to the winds. As we continued to travel around the mountain, gusts began literally blowing us backwards. Each of us looked like a news reporter getting blown by hurricane force winds on the beach. Except unlike at the beach, if one of our groups fell, the plunge was 1500 vertical feet down a steep ice and rock covered slope. Climbing towards the summit around the north peak of Mt. Shasta. Ferocious wind velocities began as we rounded the bend on the left of this photo. We could see where we had to go. It was just behind those rocks above us . . . you could almost reach out and touch it . . . it was so close. You could smell it, too—the sulphurous odor coming from the top of the volcano was detectable notwithstanding the ripping winds. After eight bleary-eyed hours of climbing in the wind, after tramping up to base camp with fully loaded packs the previous day, after assembling the whole group in California, after many of us individually traveling across the United States from Virginia, after all the anticipation, planning, and effort . . . it was so damn close. There was a strong temptation just to ignore the safety concerns and continue onward. We were less than a hundred vertical feet from the summit, and yet nature had turned us back. That afternoon, back at base camp, we knew we had done the right thing. The conditions had been too dangerous to proceed. The guides suggested we should count the climb as a success, since it was not lack of physical conditioning or human error that caused the summit to elude us. We were practically there. Practically. Sometimes, reflecting back on the trip, it continues to gnaw on me to this day that we were so close yet had to turn around right at the summit. On the other hand, the weather added an epic perspective to the trip and provided an up close glimpse of the physical and psychological conditions world-class mountain climbers experience when confronted with extreme weather. 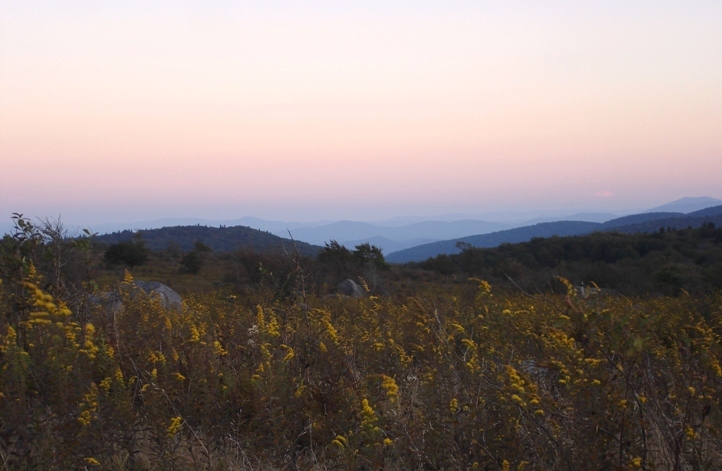 While the Southern Appalachians and the Blue Ridge may not have the altitude of the higher mountain ranges, there are similar dangers in our region that are inherent in outdoor activities in relatively remote locations. A good friend and I went on a winter backpacking trip once in the Mount Rogers National Recreation Area, and we almost got stuck in a two foot snowstorm. That snowstorm was totally unpredicted. Late season snow can hit higher elevations even in the South. We once were caught in a huge snowstorm in the Smoky Mountain National Park and were forced to stay in an overcrowded shelter. When we got back home, we saw that the freak storm had caused an unheard of snow delay during the spring race at the Bristol Motor Speedway. While on both of these occasions we were prepared with equipment and clothing, the weather took us by surprise and changed the scope of the trips. I am sure there were backpackers and campers in the Cherokee and Jefferson National Forests when the tornadoes came through our region. Some were probably shocked by the change in the weather even if they were on the periphery of the tornadic activity. Summer storms can be the most dangerous type of weather in the mountains. 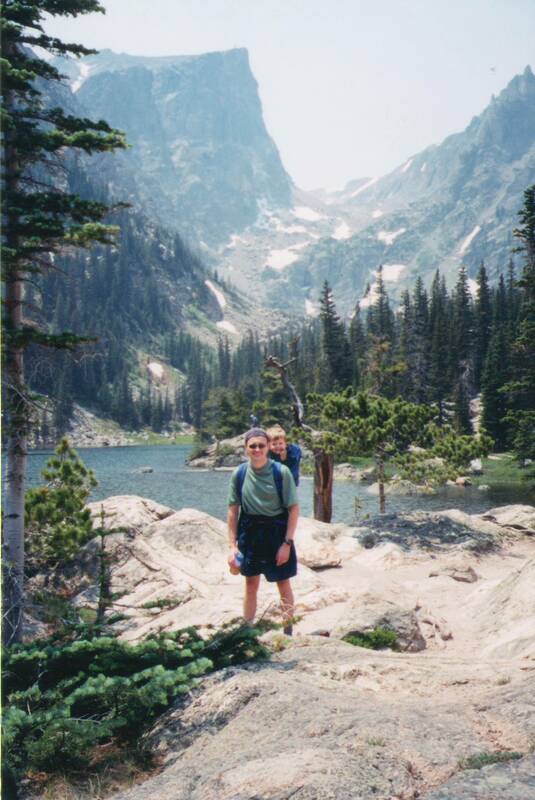 Perhaps the scariest weather phenomenon I have experienced was in Rocky Mountain National Park in July 2002. My wife, young son Karl, and I went to Colorado for a vacation. We camped in the national park, and one of the days I went for a day hike with my son in a Kelty child carrier. This is a carrier that has a child seat built into an external aluminum frame that the adult wears like a backpack. My son and I were traveling up one of the lower approaches to the Keyhole Route, the famous hike that climbs Longs Peak, the highest mountain in the park. My idea was to hike up the trail for a few hours, and then head back to the parking lot. We left the parking lot in the middle afternoon on a beautiful, warm summer day. The sky was cloudless and cobalt blue. After about an hour of hiking, during which we passed other hikers, a single, low-lying cloud became visible as it skirted across the mountains we were approaching. The cloud hugged the mountains, snaking over them and towards us, expanding as it approached. At first it was innocuous but became ominous as it got closer. The sky above us started to turn from blue to grey, even though the sky was blue everywhere else. The dark, grey mass came right at us. We turned around and started back down the trail. I walked as quickly as I could with Karl in the backpack carrier. Then I could feel the electricity in the air. The hair on my neck literally started to stand on end. My three-year old son, sensing the danger, started to cry uncontrollably. Lightning flashed everywhere, in the heavens and with crystal-clear sharp, white bolts striking the foot of the mountains immediately behind us. The thunder reverberated in the amphitheater of peaks surrounding us, amplifying the already deafening sound. The dark cloud with wispy white tendrils swirled around us, seemingly inescapable, as if we were being drawn into a grey whirlpool above. I had experienced this kind of weather before in the East and Midwest, but with less intensity. I had also read about what was happening to us. Anyone who has researched hiking out West has read about the quick developing, high altitude summer lightning storms prevalent in the Rockies. I knew I was about to be in the middle of one, and I knew they could be deadly. And I was acutely aware that I had my helpless toddler son strapped on my back in what amounted to a high-tech version of a lightning rod. Telling Karl everything would be alright in the most soothing voice I could manage in the middle of a full-on lightning storm and saying a silent prayer for both of us, I walked still faster to get below the treeline. Then, just as quickly as it developed, the storm cloud dissipated. “So fast, so sudden,” it was gone. In fact, by the time we made it back to the trailhead, the sun was shining again. Nature had been merciful on this day. While I have not had an experience quite as scary as the one in Rocky Mountain National Park with my son, I have been in several situations that are comparable while hiking and running, and I have been caught out on the road cycling numerous times and subject to unpredicted torrential downpours. Indeed, afternoon lightening and thunderstorms are practically de rigueur during the summertime in the Southern Appalachians. As we have known since time immemorial, as Robert Burns wrote in 1785, nature may cause men’s best laid plans to go awry. Sometimes the effect of nature’s power cannot be avoided—the devastation in Glade Spring is an example of this. From our perspective as outdoorsmen and women, such incidents serve as reminders that we should always respect nature’s power, be humble, and not allow our vanity and hubris to ever lead us to underestimate the dangers when we go outdoors. Appalachian TrailClimbingVirginia Creeper TrailWashington County Va. I was surprised that there were any eagles in the mountains of Virginia. I personally have not seen a single bald eagle in the last 20+ years I have been hiking in the region. As of the time of this writing there are no bald eagles officially reported in Wythe County per the Virginia Bald Eagle tracking program of the Center for Conservation Biology. In fact, it looks like the only reported nesting areas in Southwestern Virginia are in Tazewell County and Buchanan County. This would mean that this bald eagle was either migrating from another region or was a native resident that came here naturally and without human introduction. For this reason—and in the interest of protecting it and the landowners—I won’t specifically identify where in the county it was seen. The mountainous areas of Wythe, Grayson, Smyth and Washington counties would seem to be logical areas of reintroduction for bald eagles since there are still remote, larger wilderness areas (by Eastern U.S. standards) and an abundance of creeks and streams with trout and other aquatic life for the eagle’s food supply. While I have read they usually prefer large open bodies of water, it may be possible there are enough larger streams and lakes in Southwest Virginia to accommodate some of these animals. Apparently the bald eagle’s plumage was not completely white; there were still some grey flecks visible. As you can tell in the above photo, it does appear that it was not completely white. According to the Virginia Department of Game and Inland Fisheries bald eagle fact page, a bald eagle does not fully obtain the characteristic white plumage until it is five years old, when it reaches maturity. It is possible it was still a youngster, or it was wet and looked somewhat off-white. In any event, it’s a remarkable thing that this grand bird of prey may be back in part of Southwestern Virginia. This weekend two good friends, my wife, and I drove over to Boone, North Carolina for the evening to attend the local screening of the Banff Mountain Film Festival at the Farthing Auditorium at Appalachian State University. The Banff Mountain Film Festival is the largest and oldest film festival for celebrating mountain sports and culture. The festival takes place in Banff, Alberta, and then a shorter version travels around North America (and the world) for screenings of the best films. The Boone screening, a two night affair, is supposed to be one of the largest outside of the actual festival in Banff. Our road trip was about an hour and ten minutes via Route 91 through Mountain City, Tennessee and up Route 421. As we went through Trade, Tennessee, we were treated to a setting sun shining directly on snow-capped mountains on the North Carolina side of the state line. The upper half of the mountains had a nice dusting of fresh snow that looked like someone had dumped powder sugar on them. Apparently it had been snowing all day in the higher elevations, setting the mood nicely. Arriving at Farthing Auditorium, the crowds were raucous, and there was a lot of energy anticipating the screening. We watched five films. WildWater, Eastern Rises, and The Swiss Machine were the most memorable. WildWater is about the spiritual aspects of paddling in wild places and the devotion of those who paddle. The film contained incredible footage, including creek boating in Colorado, rafting in the Grand Canyon, and the massive rapids of the North Fork of the Payette River in Idaho during high water. Eastern Rises seemed to be the best liked film of the night. It documented a bunch of guys who took an incredible fly fishing trip to Kamchatka, Russia. Kamchatka is one of the most remote areas of the world: A vast, basically unpopulated peninsula across the Bearing Sea from Alaska and to the north of Japan and China. In the film these guys fished super remote rivers and streams, many without names. The trout were huge, and they were rising to go after gigantic custom-tied flies. The guys’ reverence for trout fishing and the pristine waters they fished came through, and their irreverence towards one another was hilarious. This is one entertaining movie regardless of whether you are personally into fly fishing. The Swiss Machine was an adventure biography of Ueli Steck, an alpinist who is a speed climber. The film shows Steck climbing in the Himalaya, Yosemite, and in the Alps. The film leads up to his speed ascent of the north face of the Eiger. Viewing the steepness of the Eiger face on the big screen almost made me queasy. The filming shows how dangerous speed climbing can be. Yet the film is quite inspirational. Steck’s athleticism and determination are well conveyed for such a shorter film. The cinematography in the final scene is superb. Coming back from the screening, appropriately enough it began to thunder snow on the drive home. This is in April in Virginia, mind you. There are additional screenings of the Banff Film Festival in other places this year. This was the first year I was able to attend the annual festival; if you have a chance to see it sometime, I highly recommend it. It’s inspirational and definitely makes you want to go get into the outdoors in the mountains. Recently my minister gave a sermon that explained the concepts of chronos time and kairos time. Chronos time is that time measured by the clock. Kairos time, on the other hand, is the concept of the Lord’s time, which does not correspond to chronos time and may not be measured. Kairos time is metaphysical and beyond human comprehension. This concept goes back at least to Greek times, when it was understood that time could be more than a measured unit. In our modern age, chronos time is what drives us both at work and home. We constantly confront deadlines, whether imposed by a third-party, our boss, or ourselves. In my profession, for example, the court sets deadlines in litigation for filing lawsuits, filing papers, scheduling these cases for hearings and trials, etc. Clients set deadlines for projects and transactions. My profession also measures my worth, or value, based upon chronos time. For most legal work, the billing unit is tenths of an hour, or six-minute increments of time. Most jobs are similar in that meeting deadlines and time spent on the job wholly or to some extent measure performance. Scheduling and time commitments are also ubiquitous aspects of personal life. There is always so little time and so much to do. Indeed, in an increasingly busy, complicated and technological world, even “finding time” to be outdoors can be difficult. In most outdoor sports, chronos time determines victory or measures success. Whether racing against a competitor or directly against the clock, we are competing in chronos time. When we race, we are conscious—usually very conscious—of the passage of time. We wear watches that can keep track of it down to the hundredth of a second, and we time ourselves even in training. We also, however, can experience kairos-like time in the outdoors. Upon reflection I believe this may be one of the most important reasons those of us who are attracted to the outdoors spend time there. In the outdoors time can become metaphysical. The beauty of outside and our exertion somehow converts ordinary chronos time to kairos-like time or at least may allow us to experience something akin to kairos time. Reinhold Messner, the great mountain climber who has spent as much time alone in the mountains as anybody, has stated that while climbing his perception of time could become altered. Messner has reported that while climbing he has had conversations with his deceased brother, and that at times when at altitude his entire existence seemed to be reduced to nothing more than a single, breathing lung. Reading through literature, it is apparent that mind-altering or other virtual out-of-body type experiences like this are not that uncommon among extreme outdoor athletes, especially when they are alone and in remote areas. They also almost universally experience kairos-like time. A friend of mine who hiked the entire Appalachian Trail once told me that his journey completely altered the way he experienced and viewed time. “Time was meaningless for me on the trail,” he told me. This was one of the most memorable and important experiences of his 2000+ mile journey. When I run, time may become slower and faster—sometimes simultaneously. Time can seem to palpably slow as my mind relaxes, clears and yet races through thought. For example, I wrote this entire essay in my mind within a one mile section of the Virginia Creeper Trail while running. When we get in “the zone”—and all endurance athletes know what this means—time as we ordinarily experience it is altered or may even seem to stop altogether. In “the zone” there is a zen-like state of mind, feelings of a sort of euphoria, and temporal freedom. Our mind relaxes until there is only the pleasantly repetitive, meditative stride while hiking or running. While cycling, there is only the trance-like pedaling cadence, legs “ticking like a metronome,” as the saying goes. We don’t always achieve this state of mind on every outing, however when we do it is a truly transcendent experience. It’s part what keeps us coming back to these activities. “The zone” has been extensively studied by scientific experts, and its cause is not well understood. One possible yet inconclusive theory is that it is somehow related to the endocannabinoid system. Like “the zone,” the phenomenon of kairos-like time in the outdoors has not been scientifically explained. Are these experiences merely a perception resulting from the mind-altering physiological effects of exercise in the outdoors, an endorphin-induced high no different from the effects of a drug? Is our perception simply the calming effect of being in nature? Or is the different kind of time experienced in the outdoors not just a perception, but a reality: Perhaps the closest we can come to appreciating an actual ordered yet unmeasured kind of time like kairos?